Categories: Fire, Ice, Materials & Texture. 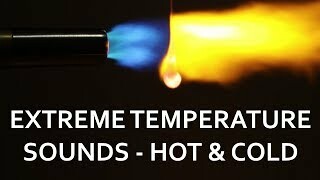 The recordings in Thermal Flux have a temperature range of over 2000°F! From bone chilling -119°F dry ice to blistering 1900°F molten glass. The heart of Thermal flux is extremely hot and cold objects interacting with each other. All of the sounds you hear are made solely by potential and kinetic thermal energy of the many props… thermodynamics at work! What’s the benefit of 192kHz recordings? Ultrasonic content! When you take a 192kHz file and slow it down enough, these ultrasonic sounds become audible. Not only does this maintain more fidelity when files are slowed down, but it can also reveal aspects of the SFX you’d normally never hear. Thermal flux contains quality frequency information up to ~65kHz, giving you ample room to stretch and morph these sounds in your next project. Many SFX in Thermal Flux were captured by multiple microphones. Each microphone was chosen to give a unique sonic perspective and/or mono/stereo option. For instance… When a red hot ball bearing is dropped into water, you have the option of using a standard mic perspective or choosing contact mics on the metal bowl. When water is dripped onto white-hot sand, you have mono and stereo mic options that showcase different frequency spectrums of the same sound. Thermal Flux comes with thorough metadata that works across all popular audio database software. Each file is embedded with exhaustive information about the recording. Aside from the usual description, many other fields are available that provide useful tidbits like recording notes, microphone information/placement, category, and sub-category. All sound effects also come embedded with an image showing exactly what was happening during the recording.